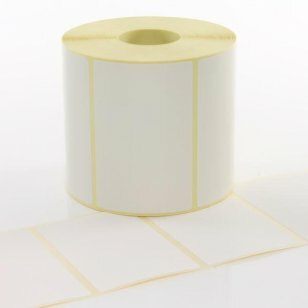 50mm x 25mm White Paper Direct Thermal Labels for Labelstation printers. 1400 labels per roll. Available In stock for fast dispatch. Shop Now! White paper direct thermal labels. Permanent high adhesive so the labels stick to most clean dry surfaces. Direct thermal labels do not require a print ribbon. LabelStation white paper direct thermal labels are supplied on rolls and are ideal for a wide range labelling applications where long term durabily is not needed. Ideal for shipping and courier labels, direct thermal paper labels do not need a print ribbon to create the printed image. The label stock is top coated with a heat sensitive layer which blackens when in contact with the LabelStations print head. The labels are available in a wide range of sizes and minimum order quantity is one roll of any given size.